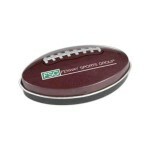 Our custom football mint tins are the ideal promotional item for any sporting themed event. These tins are not only reusable, but they’re also recyclable. Includes an embossed detailed tin filled with yummy mint candy. Also available in a baseball shape.